Situated only a couple of miles away from Mostyn hall on a hill called ‘Mynydd Mostyn’ stands Maen Achwyfan, probably the tallest wheel cross in the whole of Wales at 3.4 metres high. 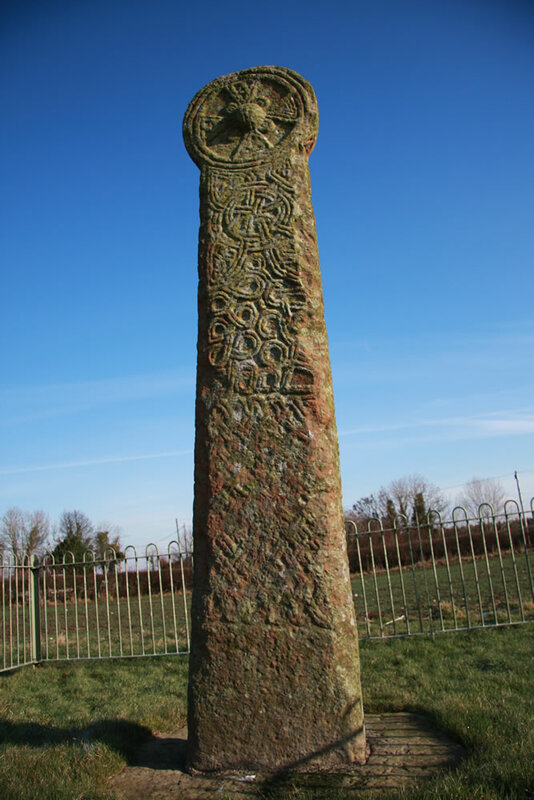 The stone pillar is wonderfully preserved being completely decorated with engraved patterns, mainly interlace designs but also the outlines of animals and the figure of a man with a spear. The decoration is said to have been influenced by Viking design. However, not a great deal is known about the monolithic cross with the Cadw information board merely stating that it may commemorate an individual or an event. It has been suggestively dated to the late 10th century. The name of the cross has been interpreted as ‘stone of lamentation’ though others have linked it to the nearby Flintshire parish of Dyserth whose church was founded by and dedicated to a 6th century monk named St. Cwyfan. There are numerous tumuli in the vicinity of the pillar causing some people to label it as a ‘monument of slaughter’. During the lifetime of Sir Roger Mostyn (c. 1568 – 1642) an abundance of carcasses and skulls were found nearby, some of them cut and a couple of them bearing round holes in them as if pierced with an arrow.